Hello Linux Geeksters. As you may know, FrostWire is a free, open-source, cross-platform BitTorrent application, running on Linux, Mac OS X and Windows. The latest version available is FrostWire 5.7.5, which comes with an improved mp4 parser, improved cloud search results, support for Java 8 and fixes for both the soundcloud url track/set downloads and cloud download errors. 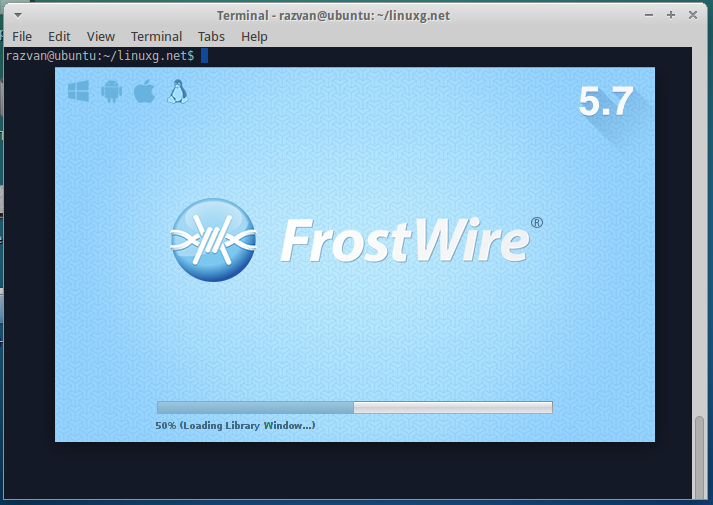 In this article I will show you how to install FrostWire 5.7.5 on Ubuntu, Linux Mint, Pinguy OS, LXLE, Elementary OS, Peppermint, Linux Lite, Deepin, Debian, Kwheezy, Crunchbang, Fedora, CentOS, OpenSUSE, Mageia and OpenMandriva systems. For Ubuntu, Debian and derivatives, the frostwire deb package is available via sourceforge, so we have to download the package from there and install it via command-line. I prefer gdebi over dpkg, due to the fact that it also handles dependencies. For Fedora, CentOS, OpenSUSE, Mageia and OpenMandriva systems, the rpm package can be also downloaded from sourceforge and installed via command-line.